James T. Kirby, Jr., Ph.D.
Kaliakin, V. N., Kirby, J. T., Yamamuro, J., Bhattacharya, B. and Shenton, H. W. (eds), EM2004, The 17th ASCE Engineering Mechanics Conference, Newark, June 13-16, 2004. Published on CD. Kirby, J. T., 1997, "Nonlinear, dispersive long waves in water of variable depth", in Gravity Waves in Water of Finite Depth, J. N. Hunt (ed). Advances in Fluid Mechanics}, 10, 55-125, Computational Mechanics Publications. Martin, P. A., Dalrymple, R. A. and Kirby, J. T., 1997, "Parabolic modelling of water waves'', in Gravity Waves in Water of Finite Depth, J. N. Hunt (ed). Advances in Fluid Mechanics}, 10, 169-213, Computational Mechanics Publications. Kirby, J. T., 2003, "Boussinesq models and applications to nearshore wave propagation, surfzone processes and wave-induced currents", in Advances in Coastal Modeling, V. C. Lakhan (ed), Elsevier, 1-41. Kirby, J.T. and Dalrymple, R.A., 1983, "Propagation of obliquely incident water waves over a submerged trench", Journal of Fluid Mechanics, 133, 47-63, doi:10.1017/S0022112083001780. Kirby, J.T. and Dalrymple, R.A., 1983, "A parabolic equation for the combined refraction-diffraction of Stokes waves by mildly-varying topography", Journal of Fluid Mechanics, 136, 453-466, doi:10.1017/S0022112083002232. Dalrymple, R.A., Kirby, J.T. and Hwang, P.A., 1984, "Wave diffraction due to areas of energy dissipation", Journal of Waterway, Port, Coastal and Ocean Engineering, 110, 67-79, doi:10.1061/(ASCE)0733-950X(1984)110:1(67). Liu, P.L.-F., Yoon, S.B. and Kirby, J.T., 1985, "Nonlinear refraction-diffraction of waves in shallow water", Journal of Fluid Mechanics, 153, 184-201, doi:10.1017/S0022112085001203. Kirby, J.T., 1986, "A general wave equation for waves over rippled beds", Journal of Fluid Mechanics, 162, 171-186, doi:10.1017/S0022112086001994. Kirby, J. T., 1986, "On the gradual reflection of weakly-nonlinear Stokes waves in regions with varying topography", Journal of Fluid Mechanics, 162, 187-209, doi:10.1017/S0022112086002008. Kirby, J. T. and Dalrymple, R. A., 1986, "Modelling waves in surfzones and around islands", Journal of Waterway, Port, Coastal and Ocean Engineering, 112, 78-93, doi:10.1061/(ASCE)0733-950X(1986)112:1(78). Dalrymple, R. A. and Kirby, J. T., 1986, "Water waves over ripples", Journal of Waterway, Port, Coastal and Ocean Engineering, 112, 309-319, doi:10.1061/(ASCE)0733-950X(1986)112:2(309). Kirby, J. T., Dalrymple, R. A. and Seo, S. N., 1987, "Propagation of obliquely incident water waves over a trench 2. Currents flowing along the trench", Journal of Fluid Mechanics, 176, 95-116, doi:10.1017/S0022112087000582. Kirby, J. T., 1988, "Current effects on resonant reflection of surface water waves by sand bars", Journal of Fluid Mechanics, 186, 501-520, doi:10.1017/S0022112088000242. Dalrymple, R. A. and Kirby, J. T., 1988, "Models for very wide-angle water waves and wave diffraction", Journal of Fluid Mechanics, 192, 33-50, doi:10.1017/S0022112088001776. Kirby, J. T., 1988, "Parabolic wave computations in non-orthogonal coordinate systems", Journal of Waterway, Port, Coastal and Ocean Engineering, 114, 673-685, doi:10.1061/(ASCE)0733-950X(1988)114:6(673). Dalrymple, R. A., Suh, K., Kirby, J. T. and Chae, J. W., 1989, "Models for very wide-angle water waves and wave diffraction. Part 2. Irregular bathymetry", Journal of Fluid Mechanics, 201, 299-322, doi:10.1017/S0022112089000959. Suh, K. D., Dalrymple, R. A. and Kirby, J. T., 1990, "An angular spectrum model for propagation of Stokes waves", Journal of Fluid Mechanics, 221, 205-232, doi:10.1017/S0022112090003548. Kirby, J. T., 1991, "Intercomparison of truncated series solutions for shallow water waves", Journal of Waterway, Port, Coastal and Ocean Engineering, 117, 143-155, doi:10.1061/(ASCE)0733-950X(1991)117:2(143). Bailard, J. A., DeVries, J. W. and Kirby, J. T., 1992, "Considerations in using Bragg reflection for storm erosion protection", J. Waterway, Port, Coastal and Ocean Engrng., 118, 62-74, doi:10.1061/(ASCE)0733-950X(1992)118:1(62). Dalrymple, R. A. and Kirby, J. T., 1992, "Angular spectrum modelling of water waves", CRC Reviews in Aquatic Sciences, 6, 383-404. Dalrymple, R. A., Kirby, J. T. and Martin, P. A., 1994, "Spectral methods for forward-propagating water waves in conformally-mapped channels", Applied Ocean Research, 16, 249-266, doi:10.1016/S0141-1187(94)90015-9. Lee, C. H. and Kirby. J. T., 1994, "Analytical comparison of time-dependent mild-slope equations", Journal of the Korean Society of Coastal and Ocean Engineers, 6, 389-396. Ting, F. C.-K. and Kirby, J. T., 1995, "Dynamics of surf-zone turbulence in a strong plunging breaker", Coastal Engineering, 24, 177-204, doi:10.1016/0378-3839(94)00036-W.
Wei, G., Kirby, J. T., Grilli, S. T. and Subramanya, R., 1995, "A fully nonlinear Boussinesq model for surface waves. I. Highly nonlinear, unsteady waves", Journal of Fluid Mechanics, 294, 71-92, doi:10.1017/S0022112095002813. Wei, G. and Kirby, J. T., 1995, "A time-dependent numerical code for extended Boussinesq equations", Journal of Waterway, Port, Coastal and Ocean Engineering, 121, 251-261, doi:10.1061/(ASCE)0733-950X(1995)121:5(251). Ting, F. C. K. and Kirby, J. T., 1996, "Dynamics of surf-zone turbulence in a spilling breaker", Coastal Engineering, 27, 131-160, doi:10.1016/0378-3839(95)00037-2. Kaihatu, J. M. and Kirby, J. T., 1998, "Two-dimensional parabolic modeling of extended Boussinesq equations'', Journal of Waterway, Port, Coastal and Ocean Engineering, 124, 57-67, doi:10.1061/(ASCE)0733-950X(1998)124:2(57). Chawla, A., Ozkan-Haller, H. T. and Kirby, J. T., 1998, "Spectral model for wave transformation over irregular bathymetry", Journal of Waterway, Port, Coastal and Ocean Engineering, 124, 189-198, doi:10.1061/(ASCE)0733-950X(1998)124:4(189). Wei, G., Kirby, J. T. and Sinha, A., 1999, "Generation of waves in Boussinesq models using a source function method", Coastal Engineering, 36, 271-299, doi:10.1016/S0378-3839(99)00009-5. Gobbi, M. F. and Kirby, J. T., 1999, "Wave evolution over submerged sills: Tests of a high-order Boussinesq model", Coastal Engineering, 37, 57-96, doi:10.1016/S0378-3839(99)00015-0, and erratum, 40, 277, 2000, doi:10.1016/S0378-3839(00)00022-3. Kennedy, A. B, Chen, Q., Kirby, J. T., and Dalrymple, R. A., 2000, "Boussinesq modeling of wave transformation, breaking and runup. I: One dimension", Journal of Waterway, Port, Coastal and Ocean Engineering, 126, 39-47, doi:10.1061/(ASCE)0733-950X(2000)126:1(39) . Chen, Q., Kirby, J. T., Dalrymple, R. A., Kennedy, A. B. and Chawla, A., 2000, "Boussinesq modeling of wave transformation, breaking and runup. II: Two horizontal dimensions", Journal of Waterway, Port, Coastal and Ocean Engineering, 126, 48-56, doi:10.1061/(ASCE)0733-950X(2000)126:1(48) . Gobbi, M. F., Kirby, J. T. and Wei, G., 2000, "A fully nonlinear Boussinesq model for surface waves. II. Extension to O(kh^4)", Journal of Fluid Mechanics, 405, 181-210, doi:10.1017/S0022112099007247. Kennedy, A. B., Dalrymple, R. A., Kirby, J. T. and Chen, Q., 2000, "Determination of inverse depths using direct Boussinesq modelling", Journal of Waterway, Port, Coastal and Ocean Engineering, 126, 206-214, doi: 10.1061/(ASCE)0733-950X(2000)126:4(206) . Svendsen, I. A., Veeramony, J., Bakunin, J. and Kirby, J. T., 2000, "The flow in weak turbulent hydraulic jumps", Journal of Fluid Mechanics, 418, 25-57, doi:10.1017/S0022112000008867. Shi, F., Dalrymple, R. A., Kirby, J. T., Chen, Q. and Kennedy, A., 2001, "A fully nonlinear Boussinesq model in generalized curvilinear coordinates", Coastal Engineering, 42, 337-358, doi:10.1016/S0378-3839(00)00067-3. Kennedy, A. B., Kirby, J. T. and Gobbi, M. F., 2002, "Simplified higher order Boussinesq equations. 1: Linear considerations", Coastal Engineering, 44, 205-229, doi:10.1016/S0378-3839(01)00032-1. Shi, F., Svendsen, I. A., Kirby, J. T. and Smith, J. M., 2003, "A curvilinear version of a quasi-3D nearshore circulation model", Coastal Engineering, 49, 99-124, doi:10.1016/S0378-3839(03)00049-8. Shi, F. and Kirby, J. T., 2005, "Curvilinear parabolic approximation for surface wave transformation with wave-current interaction", Journal of Computational Physics, 204, 562-586. Ioualalen, M., J. A. Asavanant, N. Kaewbanjak, N., Grilli, S. T., Kirby, J. T. and Watts, P., 2007, "Modeling of the 26th December 2004 Indian Ocean tsunami: Case study of impact in Thailand", Journal of Geophysical Research, 112, C07024, doi:10.1029/2006JC003850. Grilli, S. T., Ioualalen, M., Asavanant, J., Shi, F., Kirby, J. T. and Watts, P., 2007, "Source constraints and model simulation of the December 26, 2004 Indian Ocean tsunami", Journal of Waterway, Port, Coastal and Ocean Engineering, 133, 414-428, doi:10.1061/(ASCE)0733-950X(2007)133:6(414). Shi, F., Kirby, J. T. and Hanes, D. M., 2007, "An efficient mode-splitting method for a curvilinear nearshore circulation model", Coastal Engineering, 54, 811-824, doi:10.1016/j.coastaleng.2007.05.009. Long, W., Kirby, J. T. and Shao, Z., 2008, "A numerical scheme for morphological bed level calculations", Coastal Engineering, 55, 167-180, doi:10.1016/j.coastaleng.2007.09.009. Debsarma, S., Das, K. P. and Kirby, J. T., 2010, "Fully nonlinear higher order model equations for long internal waves in a two fluid system", Journal of Fluid Mechanics, 645, 281-303, doi:10.1017/S0022112010000601. Zhang, W.-Z., Shi, F., Hong, H.-S., Shang, S.-P., Kirby, J. T., 2010, "Tide-surge interaction intensified by the Taiwan Strait", Journal of Geophysical Research, 115, C06012, doi:10.1029/2009JC005762. Shi, F., Kirby, J. T. and Ma, G., 2010, "Modeling quiescent phase transport of air bubbles induced by breaking waves", Ocean Modelling, 35, 105-117, doi:10.1016/j.ocemod.2010.07.002. Grilli, S. T., Dubosq, S., Pophet, N., Perignon, Y., Kirby, J. T. and Shi, F., 2010, "Numerical simulation of co-seismic tsunami impact on the North Shore of Puerto Rico and far-field impact on the US East Coast: a first-order hazard analysis", Natural Hazards and Earth Systems Science, 10, 2109-2125, doi:10.5194/nhess-10-2109-2010. Geiman, J. D., Kirby, J. T., Reniers, A. J. H. M. and MacMahan, J. H., 2011, "Effects of wave-averaging on estimates of fluid mixing in the surfzone", Journal of Geophysical Research, 116, C04006, doi:10.1029/2010JC006678. Shi, F., Hanes, D. M., Kirby, J. T., Erikson, L., Barnard, P. and Eshleman, J., 2011, "Pressure gradient-dominated nearshore circulation on a beach influenced by an adjacent large inlet", Journal of Geophysical Research, 116, C04020, doi:10.1029/2010JC006788. Hampson, R., MacMahan, J. and Kirby, J. T., 2011, "A low-cost hydrographic kayak surveying system", Journal of Coastal Research, 27, 600-603, doi:10.2112/JCOASTRES-D-09-00108. Kirby, J. T., Shi, F., Tehranirad, B., Harris, J. C. and Grilli, S. T., 2013, "Dispersive tsunami waves in the ocean: model equations and sensitivity to dispersion and Coriolis effects", Ocean Modelling, 62, 39-55, doi:10.1016/j.ocemod.2012.11.009, Certificate for Highly Cited Research . Geiman, J. D. and Kirby, J. T., 2013, "Unforced oscillation of rip-current vortex cells", Journal of Physical Oceanography, 43, 477-497, doi:10.1175/JPO-D-11-0164.1. Shi, F., Cai, F., Kirby, J. T. and Zheng, J., 2013, "Morphological modeling of a nourished bayside beach with a low tide terrace", Coastal Engineering, 78, 23-34, doi:10.1016/j.coastaleng.2013.03.005. Grilli, S. T., Harris, J. C., Tajalli Bakhsh, T., Masterlark, T. L., Kyriakopoulus, C., Kirby, J. T. and Shi, F., 2013, "Numerical simulation of the 2011 Tohoku tsunami based on a new transient FEM co-seismic source: Comparison to far- and near-field observation", Pure and Applied Geophysics, 170, 1333-1359, doi:10.1007/s00024-012-0528-y . Ma, G., Kirby, J. T. and Shi, F., 2013, "Numerical simulation of tsunami waves generated by deformable submarine landslides", Ocean Modelling, 69, 146-165, doi:10.1016/j.ocemod.2013.07.001. Choi, J., Kirby, J. T. and Yoon, S. B., 2015, "Boussinesq modeling of longshore currents in the Sandy Duck experiment under directional random wave conditions", Coastal Engineering, 101, 17-34, doi:10.1016/j.coastaleng.2015.04.005 , and Reply to Discussion, 106, 4-6, doi:10.1016/j.coastaleng.2015.09.002 . Wu, G., Shi, F., Kirby, J. T., Mieras, R., Liang, B., Li, H. and Shi, J., 2016, "A pre-storage, subgrid model for simulating flooding and draining processes in salt marshes", Coastal Engineering, 108, 65-78, doi:10.1016/j.coastaleng.2015.11.008. Derakhti, M. and Kirby, J. T., 2016, "Breaking-onset, energy and momentum flux in unsteady focused wave packets", Journal of Fluid Mechanics, 790, 553-581, doi:10.1017/jfm.2016.17. Orzech, M., Shi, F., Veeramony, J., Bateman, S., Calantoni, J. and Kirby, J. T., 2016, "Incorporating floating surface objects into a fully dispersive surface wave model", Ocean Modelling, 102, 14-26, doi:10.1016/j.ocemod.2016.04.007. Ma, G., Farahani, A. A., Kirby, J. T. and Shi, F., 2016, "Modeling wave-structure interactions by an immersed boundary method in a sigma-coordinate model", Ocean Engineering, 125, 238-247, doi:10.1016/j.oceaneng.2016.08.027. Derakhti, M., Kirby, J. T., Shi, F. and Ma, G., 2016, "NHWAVE: Consistent boundary conditions and turbulence modeling", Ocean Modelling, 106, 121-130, doi:10.1016/j.ocemod.2016.09.002. Prestininzi, P., Abdolali, A., Montessori, A., Kirby, J. T. and La Rocca, M., 2016, "Lattice Boltzmann approach for hydro-acoustic waves generated by tsunamigenic sea bottom displacement", Ocean Modelling, 107, 14-20, doi:10.1016/j.ocemod.2016.09.012. Kirby, J. T., 2016, "Boussinesq models and their application to coastal processes across a wide range of scales", Journal of Waterway, Port, Coastal and Ocean Engineering, 142(6), 03116005, doi:10.1061/(ASCE)WW.1943-5460.0000350. Schnyder, J. S. D., Eberli, G. P., Kirby, J. T., Shi, F., Tehranirad, B., Mulder, T., Ducassou, E., Hebbeln, D. and Wintersteller, P., 2016, "Tsunamis caused by submarine slope failures along western Great Bahama Bank", Scientific Reports (Nature), 6, 35925, doi:10.1038/srep35925. Millero Prize, best student publication (2016), Rosenstiel School, University of Miami , (press release). Derakhti, M., Kirby, J. T., Shi, F. and Ma, G., 2016, "Wave breaking in the surf zone and deep water in a non-hydrostatic RANS model. Part 1: Organized wave motions", Ocean Modelling, 107, 125-138, doi:10.1016/j.ocemod.2016.09.001. Derakhti, M., Kirby, J. T., Shi, F. and Ma, G., 2016, "Wave breaking in the surf zone and deep water in a non-hydrostatic RANS model. Part 2: Turbulence and mean circulation", Ocean Modelling, 107, 139-150, doi:10.1016/j.ocemod.2016.09.011. Kirby, J. T., Shi, F., Nicolsky, D. and Misra, S., 2016, "The 27 April 1975 Kitimat, British Columbia submarine landslide tsunami: A comparison of modeling approaches", Landslides, 13, 1421-1434, doi:10.1007/s10346-016-0682-x. Shi, F., Chickadel, C., Hsu, T.-J., Kirby, J. T., Farquharson, G. and Ma, G., 2017, "High-resolution non-hydrostatic modeling of frontal features in the mouth of the Columbia River", Estuaries and Coasts, 40, 296-309, doi:10.1007/s12237-016-0132-y, and supplement . Grilli, S. T., Shelby, M., Kimmoun, O., Dupont, G., Nicolsky, D., Ma, G., Kirby, J. T. and Shi, F., 2017, "Modeling coastal tsunami hazard from submarine mass failures: effect of slide rheology, experimental validation, and case studies off the US East Coast", Natural Hazards, 86, 353-391, doi:10.1007/s11069-016-2692-3. Lynett, P. J., Gately, K., Wilson, R., Montoya, L., Arcas,D., Aytore, B., Bai, Y., Bricker, J. D., Castro, M. J., Cheung, K. F., David, C. G., Dogan, G. G., Escalante, C., González, F. I., González-Vida, J. M., Grilli, S. T., Heitmann, T. W., Horrillo, J., Kânoğlu, U., Kian, R., Kirby, J. T., Li, W., Macías, J., Nicolsky, D. J., Ortega, S., Pampell-Maniso, A., Park, Y. S., Roeber, V., Sharghivand, N., Shelby, M., Shi, F., Tehranirad, B., Tolkova, E., Thio, H. K., Velioğlu, D., Yalçıner, A. C., Yamazaki, Y., Zaytsev, A., Zhang, Y. J., 2017, "Inter-model analysis of tsunami-induced coastal currents", Ocean Modelling, 114, 14-32, doi:10.1016/j.ocemod.2017.04.003. Zhou, Z., Yu, X., Hsu, T.-J., Shi, F., Geyer, W. R. and Kirby, J. T., 2017, "On non-hydrostatic coastal model simulations of shear instabilities in a stratified shear flow at high Reynolds number", Journal of Geophysical Research: Oceans, 122, 3081-3105, doi:10.1002/2016JC012334. Banihashemi, S., Kirby, J. T. and Dong, Z., 2017, "Approximation of wave action flux velocity in strongly sheared mean flows", Ocean Modelling, 116, 33-47, doi:10.1016/j.ocemod.2017.06.002. Wu, G., Li, H., Liang, B., Shi, F., Kirby, J. T. and Mieras, R., 2017, "Subgrid modeling of salt marsh hydrodynamics with effects of vegetation and vegetation zonation", Earth Surface Processes and Landforms, 42, 1755-1768, doi:10.1002/esp.4121. Kirby, J. T., 2017, "Recent advances in nearshore wave, circulation and sediment transport modeling", Journal of Marine Research, 75, 263-300, doi:10.1357/002224017821836824. Kukulka, T., Jenkins, R. L., Kirby, J. T., Shi, F. and Scarborough, R. W., 2017, "Surface wave dynamics in Delaware Bay and its adjacent coastal shelf", Journal of Geophysical Research: Oceans, 122, 8683--8706, doi:10.1002/2017JC013370. Abdolali, A. and Kirby, J. T., 2017, "Role of compressibility on tsunami propagation", Journal of Geophysical Research: Oceans, 122, 9780-9794, doi:10.1002/2017JC013054, Wiley content link. Shi, F., Malej, M., Smith, J. M. and Kirby, J. T., 2018, "Breaking of ship bores in a Boussinesq-type ship-wake model", Coastal Engineering, 132, 1-12, doi:10.1016/j.coastaleng.2017.11.002. Abdolali, A., Kadri, U., Parsons, W. and Kirby, J. T., 2018, "On the propagation of acoustic-gravity waves under elastic ice sheets", Journal of Fluid Mechanics, 837, 640-656, doi:10.1017/jfm.2017.808, Cambridge Core Share access code 5A9FC1CA9902F823CDD1098A70442449. Derakhti, M., Banner, M. L. and Kirby, J. T., 2018, "Predicting the breaking strength of gravity water waves in deep and intermediate depth", Journal of Fluid Mechanics, 848, R2, doi:10.1017/jfm.2018.352. Orzech, M. D., Shi, F., Veeramony, J., Bateman, S., Calantoni, J. and Kirby, J. T., 2018, "A coupled system for investigating the physics of wave-ice interactions", Journal of Atmospheric and Oceanic Technology, 35, 1471-1485, doi:10.1175/JTECH-D-17-0189.1. Wu, G., Shi, F., Kirby, J. T., Shi, J. and Liang, B., 2018, "Modeling wave effects on storm surge and coastal inundation", Coastal Engineering, 140, 371-382, doi:10.1016/j.coastaleng.2018.08.011. Kirby, J. T. and Derakhti, M., 2019, "Short-crested wave breaking", European Journal of Mechanics B/Fluids, 73, 100-111, doi:10.1016/j.euromechflu.2017.11.001. Schambach, L., Grilli, S. T., Kirby, J. T. and Shi, F., 2018, "Landslide tsunami hazard along the upper US East Coast: effects of slide rheology, bottom friction, and frequency dispersion", Pure and Applied Geophysics, in press, doi:10.1007/s00024-18-s-00018, Springer shared link. Lu, Y., Shi, F., Kirby, J. T. and Feng, W., 2018, "A two-layer model for oblique internal hydraulic jumps generated by a sharp lateral constriction", Journal of Fluid Mechanics, revised and resubmitted, April. Abdolali, A., Kadri, U. and Kirby, J. T., 2019, "Effect of water compressibility, sea floor elasticity, and field gravitational potential on tsunami phase speed", Scientific Reports, under review. Banihashemi, S. and Kirby, J. T., 2019, "Approximation of wave action conservation in strongly sheared mean flows", submitted to Ocean Modelling, March. Grilli, S. T., Tappin, D. R., Carey, S., Watt, S. F. L., Ward, S. N., Grilli, A. R., Engwell, S. Zhang, C., Kirby, J. T., Schambach, L. and Muin, M., 2019, "Modeling of the tsunami from the December 22, 2018 lateral collapse of Anak Krakatau volcano in the Sunda Straits of Indonesia", submitted to Scientific reports, April. Kerper, D., Hansen, H. F., Misra, S., Shi, F., Rao, P., Kirby, J.,Willey, E., Hart, S. and Ervin, D., 2017, "Nearshore FSO motion response under rapidly varying hydrodynamic loads from landslide induced tsunamis - Sensitivity to hydrodynamic forcing, mooring configuration and FSO heading", to be presented at ISOPE, San Francisco, June 25-30. Kirby, J. T., 1987, "Reflection of long nonlinear waves by nearshore bars", AGU Fall Meeting, San Francisco, Dec. 1987. Abstract published in EOS, Transactions AGU, 68, 1310. Kirby, J. T. and Kaihatu, J. M., 1990, "Advances in modeling nearshore wave climate using spectral (Boussinesq) models", presented at Advances in Coastal Engineering, Newark, November. Kirby, J. T., Kaihatu, J. M., Bowen, G. D. and Smith, J. M., 1990, "Application of spectral Boussinesq models to various problems in nearshore wave evolution", presented at the American Geophysical Union Fall Meeting, San Francisco, December 3-7, 1990. Abstract published in EOS, Transactions AGU, 71, 1369. Kaihatu, J. M. and Kirby, J. T., 1991, ``Frequency-domain water wave evolution in finite depth'', presented at the American Geophysical Union Fall Meeting, December. Abstract published in EOS, Transactions AGU, 72, Fall Meeting Suppl., 253, 1991. Kaihatu, J. M. and Kirby, J. T., 1992, ``Evolution and interaction of directional finite amplitude waves in shallow water'', presented at the AGU Fall Meeting, San Francisco. Abstract published in EOS, Transactions AGU, 73(43), Suppl., 247, 1992. Kaihatu, J. M., Wei, G. and Kirby, J. T., 1993, "Angular spectrum and time domain solutions of extended Boussinesq-type equations", presented ( with published abstract) at MEET'N'93, 1st SES-ASME-ASCE Joint Meeting, Charlottesville, VA, June 6-9. Chajes, M. J., Kirby, J. T., Yang, C. Y. and Finch, W. W., 1993, "Validating continuum analyses of buildings subjected to dynamic loads", Abstracts, 2nd U. S. National Congress on Computational Mechanics, 237, Washington, August 16-18. Kirby, J. T., Wei, G. and Kaihatu, J. M., 1993, "Time and frequency domain characteristics of wave energy dissipation in numerically modelled breaking waves", presented at the American Geophysical Union Fall Meeting, San Francisco, December 6-10, 1993. Abstract published in EOS, Transactions AGU, 74(43) Suppl. 333-334, 1993. Ozkan, H. T. and Kirby, J. T., 1994, "Numerical study of finite amplitude shear wave instabilities'', presented at the American Geophysical Union Fall Meeting, San Francisco, December 1994. Abstract published in EOS, Transactions AGU, Fall Meeting Supplement, p. 322, 1994. Wei, G. and Kirby, J. T., 1995, ``A coastal processes model based on time-domain Boussinesq equations'', presented at Coastal Dynamics '95, Gdansk, September. Cox, M. O., Howd, P. A. and Kirby, J. T., 1995, ``Shoreface geological control of nearshore wave energy'', presented at Geological Society of America meeting. Cox, M. O., Howd, P. A. and Kirby, J. T., 1995, "Application of a weakly non-linear wave refraction/diffraction model to the Wimble Shoals, NC region", presented at the American Geophysical Union Fall Meeting, December 11-15. Abstract published in EOS, Transactions AGU, Fall Meeting Supplement, F297, 1995. Ozkan, H. T. and Kirby, J. T., 1995, "Numerical study of finite amplitude shear waves", presented at the American Geophysical Union Fall Meeting, December 11-15. Abstract published in EOS, Transactions AGU, Fall Meeting Supplement, F287, 1995. Kirby, J. T., Gobbi, M. F. and Wei, G., 1995, "Kinematics and dynamics of waves in intermediate depth predicted by extended Boussinesq equations", presented at the American Geophysical Union Fall Meeting, December 11-15, 1995. Abstract published in EOS, Transactions AGU, Fall Meeting Supplement, F297, 1995. Putrevu, U., Oltman-Shay, J., Kirby, J. T. and Wei, G., 1995, "Radiation stresses in the Boussinesq approximation. Part 1: Intermediate depth", presented at the American Geophysical Union Fall Meeting , December 11-15, 1995. Abstract published in EOS, Transactions AGU, Fall Meeting Supplement, F297, 1995. Oltman-Shay, J., Putrevu, U., Kirby, J. T. and Wei, G., 1995, "Radiation stresses in the Boussinesq approximation. Part 2: Highly nonlinear waves", presented at the American Geophysical Union Fall Meeting, December 11-15, 1995. Abstract published in EOS, Transactions AGU, Fall Meeting Supplement, F297, 1995. Özkan-Haller, H. T. and Kirby, J. T., 1996, "Shear instabilities of the longshore current during Superduck", presented at the American Geophysical Union Fall Meeting, San Francisco, December 15-19. Abstract published in EOS, Transactions AGU, 77, F394, 1996. Svendsen, I. A., Veeramony, J., Kirby, J. T., 1996, "Verification of Boussinesq model for breaking waves", presented at the American Geophysical Union Fall Meeting, San Francisco, December 15-19, 1996. Abstract published in EOS, Transactions AGU, 77, F394, 1996. Kirby, J. T. and Putrevu, U., 1997, "Nonlinear evolution of shear and edge waves on open coastal beaches", presented at the American Geophysical Union Fall Meeting, San Francisco, December 8-12, 1997. Abstract published in EOS, Transactions AGU, 78, F345, 1997. Özkan-Haller, H. T., Kirby, J. T., Vidal, C., Medina, R. and Losada, I. J., 1997, 'Experimental investigation of the infragravity climate on an intertidal pocket beach ', presented at the American Geophysical Union Fall Meeting, San Francisco, December 8-12, 1997. Abstract published in EOS, Transactions AGU, 78, F345, 1997. Özkan-Haller, H. T. and Kirby, J. T., 1998, "Instabilities and nonlinear evolution of wave-induced longshore currents in the surfzone", poster presented at the Johns Hopkins Conference in Environmental Fluid Mechanics, April 2-4. Chen, Q, Dalrymple, R. A., Kirby, J. T. and Kennedy, A. B., 1998, "Boussinesq modelling of wave-induced nearshore circulation", poster presented at the Johns Hopkins Conference in Environmental Fluid Mechanics, April 2-4. Kirby, J. T., Putrevu, U. and Ozkan-Haller, H. T., 1998, "Nonlinear edge wave interactions on longshore-uniform beaches", EOS, Trans. AGU, 79, Fall Meet. Suppl., Abstract OS11B-12. Chawla, A. and Kirby, J. T., 1998, "Wave blocking on opposing currents", EOS, Trans. AGU, 79, Fall Meeting Suppl., Abstract OS11B-15. Dalrymple, R. A., Chen, Q., Kirby, J. T., Kennedy, A. and Haller, M. C., 1998, "Boussinesq modeling of rip currents", EOS, Trans. AGU, 79, Fall Meet. Suppl., Abstract OS21C-39. Chen, Q., Kirby, J. T., Dalrymple, R. A. and Kennedy, A. B., 1998, "Boussinesq modeling of wave fields at FRF, Duck, NC", EOS, Trans. AGU, 79, Fall Meet. Suppl., Abstract OS71D-09. Kirby, J. T., 1999, "Beyond Boussinesq: Extended treatments of dispersion and nonlinearity in practical nearshore wave models", presented at the SIAM Annual Meeting, Atlanta, May 9-15. Chen, Q., Kirby, J. T., Dalrymple, R. A., Kennedy, A. B., 1999, "Boussinesq modeling of longshore currents at FRF, Duck, NC", EOS, Trans. AGU, 80, Fall Meet. Suppl., Abstract OS21C-07. Kennedy, A. B., Kirby, J. T., Dalrymple, R. A. and Chen, Q., 1999, "Inference of coastal properties using a coupled video-Boussinesq system", EOS, Trans. AGU, 80, Fall Meet. Suppl., Abstract OS31C-06. Kirby, J. T., 1999, "Nearshore community model development: A look ahead", EOS, Trans. AGU, 80, Fall Meet. Suppl., Abstract OS21C-01 INVITED. Shi, F., Kirby, J. T., Dalrymple, R. A., Chen, Q. and Zhen, F., 1999, "Wave simulations in Ponce de Leon inlet using a curvilinear Boussinesq model", EOS, Trans. AGU, 80, Fall Meet. Suppl., Abstract OS12B-19. Gungordu, O. and Kirby, J. T., 2000, "Evolution of large amplitude bedforms in a flowing stream", EOS, Trans. AGU, 81 (48), Fall Meet. Suppl., Abstract OS72A-06. Kirby, J. T., Putrevu, U. and Ozkan-Haller, H. T., 2000, "Edge and shear wave interactions? ", EOS, Trans. AGU, 81 (48), Fall Meet. Suppl., Abstract OS62F-05. Shi, F., Svendsen, I. A. and Kirby, J. T., 2000, "A curvilinear version of SHORECIRC", EOS, Trans. AGU, 81(48), Fall Meet. Suppl., Abstract OS52A-11. Kaihatu, J. M., Kirby, J. T. and Svendsen, I. A., 2001, "Incorporating random wave effects in a nearshore circulation model", EOS, Transactions AGU, 82(47), Fall Meet. Suppl., Abstract OS11D-07. Watts, P., Grilli, S. T. and Kirby, J. T., 2002, ``Coupling 3D tsunami generation with Boussinesq tsunami propagation'', presented at the 27th General Assembly of the European Geophysical Society, Nice, April 21-26. Geophysical Research Abstracts, 4, EGS 02-A-02601 NH8-MO2A-007. Heitsenrether, R. M., Badiey, M., Kirby, J. T. and Forsythe, S., 2002, "Influence of fetch limited surface roughness on mid-to-high frequency acoustic propagation in shallow water'', First Pan-Am/Iberian Meeting on Acoustics, Cancun, Dec. 6-11, Journal of the Society of America, 112, 2208, doi:http://dx.doi.org/10.1121/1.4778693. Kirby, J. T., 2002, "A review of the nearshore NOPP project", EOS, Trans. AGU, 83(47), Fall Meet. Suppl., Abstract OS52E-02. Kirby, J. T., Chen, Q., Noyes, J., Elgar, S., Guza, R. T., 2002, "Evaluation of Boussinesq model predictions of nearshore hydrodynamics", EOS, Trans. AGU, 83(47), Fall Meet. Suppl., Abstract OS62E-05. Shi, F., Kirby, J. T., Dalrymple, R. A. and Chen, Q., 2002, "On nonlinear properties of waves predicted by a Boussinesq model", EOS, Trans. AGU, 83(47), Fall Meet. Suppl., Abstract OS62E-06. Watts, P., Grilli, S. T., Kirby, J. T., Fryer, G. J. and Tappin, D. R., 2002, "Landslide tsunami generation models: validation and case studies", EOS, Trans. AGU, 83(47), Fall Meet. Suppl., Abstract OS51A-0144. Grilli, S. T., Watts, P. and Kirby, J. T., 2003, "Tsunami landslide source models as a tool for analysing complex case studies", EOS Trans. AGU, 84(46), Fall Meet. Suppl., Abstract OS31A-06. Enet, F., Grilli, S. T., Watts, P. and Kirby, J. T., 2003, "Modeling and experimental validation for tsunamis generated by submarine mass failure", EOS Trans. AGU, 84(46), Fall Meet. Suppl., Abstract OS22B-1158. Grilli, S. T., Watts, P., Day, S. J. and Kirby, J. T., 2003, "Boussinesq Modeling of the Complex 1975 Kalapana, Hawaii Geological Event", EOS Trans. AGU, 84(46), Fall Meet. Suppl., Abstract OS22B-1159. Murty, T., Watts, P., Fullarton, M., Grilli, S. T., Kirby, J.T., 2003, "Boussinesq modeling of the 1975 Kitimat, British Columbia landslide tsunami", EOS Trans. AGU, 84(46), Fall Meet. Suppl., Abstract OS22B-1160. Shi, F. and Kirby, J. T., 2003, "An enhanced REF/DIF model for wave predictions in tidal inlets", EOS, Trans. AGU, 8 (52), Ocean Sciences Meet. Suppl., Abstract OS42A-13. Fryer, G., Watts, P., Grilli, S. T. and Kirby, J. T., 2004, "The Aleutian landslide-tsunami of 1946", submitted for International Geological Congress, Florence, August 2004. Kirby, J. T., Shi, F., Watts, P. and Grilli, S. T., 2004, "Propagation of short, dispersive tsunami waves in ocean basins", EOS Trans. AGU, 85(47), Fall Meet. Suppl., Abstract OS21E-02. Shi, F., Nayak, M., Qin, W., Xu, L. and Kirby, J. T., 2004, ``Coupling of NearCoM, ROMS and SWAN in a MCEL system'', EOS Trans. AGU, 85(47), Fall Meet. Suppl., Abstract OS23E-04. North, E. W., Chen, S.-N., Hood, R. R., Shi, F., Sanford, L. P., Kirby, J. T., Koch, E. W., Newell, R. I. E., 2005, "Understanding the effects of oyster reefs and breakwaters on seagrass habitat: an open-source modeling approach", presented at Estuarine Research Foundation Meeting, Norfolk. Grilli, S. T., Ioualalen, M., Asavanant, J., Kirby, J. T., Shi, F., Watts, P. and Dias, F., 2005, ``Modeling of the 12/26/04 Indian Ocean tsunami generation, propagation, and coastal impact. Integration of the SEATOS cruise and other geophysical data'', Eos Trans. AGU, 86(52), Fall Meet. Suppl., Abstract U13A-07. Shi, F., Kirby, J. T. and Haas, K., 2006, ``Investigation of consistency between two types of wave force formulation in modeling of rip currents'', Eos Trans. AGU, 87(36), Ocean Sci. Meet. Suppl., Abstract OS32B-02. Guannel, G., Ozkan-Haller, H. T., Magalen, J., Haller, M. and Kirby, J., 2006, "Evaluation of boundary layer models in the mobilization and onshore transport of sediments", Eos Trans. AGU, 87(36), Ocean Sci. Meet. Suppl., Abstract OS42C-03. Magalen, J. M., Haller, M. C., Ozkan-Haller, H. T., Kirby, J. T., Guannel, G. and Teran Cobo, P., 2006, "Testing energetics-based models for onshore sediment transport", Eos Trans. AGU, 87(36), Ocean Sci. Meet. Suppl., Abstract OS35E-27. Geiman, J., Qin, W., Nayak, M., Kirby, J. T. and Badiey, M., 2006, "Strong tidal modulation of estuarine surface wind waves", EOS Trans. AGU, 87(36), Jt. Assem. Suppl., Abstract OS33A-05. Shi, F., Hanes, D. M., Eshleman, J., Erickson, L., Barnard, P. and Kirby, J., 2006, "NearCoM modeling of San Francisco Bight and its open coast", EOS Trans. AGU, 87(52), Fall Meet. Suppl., Abstract OS41B-0607. Kirby, J. T., Briganti, R., Brocchini, M. and Chen, Q. J., 2006, "Lagrangian particle statistics of numerically simulated shear waves", EOS Trans. AGU, 87(52), Fall Meet. Suppl., Abstract OS41C-0633. Grilli, S. T., Baptista, A. M., Ioualalen, M., Asavanant, J., Kirby, J. T., Shi, F. and Zhang, Y. L., 2006, "Effects of frequency dispersion on tsunami propagation and coastal impact", Geophysical Res. Abstracts , 8, 09021, SRef-ID: 1607-7962/gra/EGU06-A-09021. Chen, Y., Shi, F. and Kirby, J. T., 2007, "Coupling of ROMS and SWAN for predicting waves and currents in Delaware Bay", poster presentation at Gordon Research Conference, New London, NH. Shi, F., Kirby, J. T., Haller, M. C. and Catalan, P., 2008, "Numerical study on surfzone air bubbles using a multiphase VOF model", Ocean Sciences Meeting, Orlando, February. Guannel, G. E., Ozkan-Haller, H. T., Haller, M. C., Kirby, J. T. and Teran Cobo, P., 2008, "Modeling of sediment transport modes during CROSSTEX experiment", Ocean Sciences Meeting, Orlando, February. Kirby, J. T., MacMahan, J. H., Reniers, A., Geiman, J., Brown, J. and Stanton, T., 2008, "Model/data comparison for Lagrangian trajectories and mixing estimates over complex nearshore bathymetry", Euromech Colloquium 501: Mixing of coastal, estuarine and riverine shallow flows, Ancona, June 8-11. Abstracts published on CD. Geiman, J., Kirby, J. T., Reniers, A., MacMahan, J. H., Brown, J. W., Brown, J. A. and Stanton, T. P., 2008, "Wave-averaged and wave-resolving simulations of the RCEX experiment: Mean flows and drifter dispersion", Eos Trans. AGU, 89 (53), Fall Meeting Suppl., Abstract OS13D-1233. Hampson, R. W. and Kirby, J. T., 2008, "Video-based Nearshore Depth Inversion using WDM Method", Eos Trans. AGU, 89(53), Fall Meeting Suppl., Abstract OS21E-1224. Ma, G., Shi, F. and Kirby, J. T., 2008, "Two-phase approach for simulating surfzone bubbles", Eos Trans. AGU, 89(53), Fall Meeting Suppl., Abstract OS13D-1247. Shi, F., Zhu, S. and Kirby, J. T., 2008, "A surfzone circulation model with influence of surf-swash interaction", EOS Trans. AGU, 89 (53), Fall Meeting Suppl., Abstract OS13D-1236. Geiman, J., Kirby, J. T., Reniers, A. J. H. M., MacMahan, J. H., Brown, J. W., Brown, J. A. and Stanton, T. P., 2009, "Coherence of eddies in a rip channeled surfzone", LAPCOD 2009, La Londe-les-Maures, Sept. 7-11. Abstract C101. Geiman, J., Kirby, J. T., Reniers, A. J., MacMahan, J. H., Brown, J., Brown, J. and Stanton, T. P., 2010, "Effect of wave-averaging on coherent structure boundaries in the surfzone", EOS Trans. AGU, 91(26), Ocean Sciences Meeting Suppl., Abstract PO45G-11. Ma, G., Shi, F. and Kirby, J. T., 2010, "A polydisperse two-fluid model for surfzone bubble simulation", EOS Trans. AGU, 91(26), Ocean Sciences Meeting Suppl., Abstract PO21B-06. Shi, F., Kirby, J. T. and Hanes, D. M., 2010, "Is the erosional hotspot at Ocean Beach, San Francisco, caused by wave focussing? - From modeling point of view", EOS Trans. AGU, 91(26), Ocean Sciences Meeting Suppl., Abstract GO35A-07. Karjadi, E., Badiey, M., Kirby, J. T. and Bayindir, C., 2010, "Impact of time-varying surface gravity waves on high frequency acoustic propagation in shallow water", 159th ASA Meeting, Baltimore, April. Shi, F., Kirby, J. T. and Tehranirad, B., 2010, "A high-order adaptive time-stepping TVD solver for Boussinesq modeling of breaking waves and coastal inundation", Abstract OS51B-1312 presented at 2010 Fall Meeting, AGU, San Francisco, CA, Dec. 13-17. Ma, G., Kirby, J. T and Shi, F., 2010, "Numerical study of large-scale turbulence and bubble entrainment under surfzone breaking waves", Abstract OS51B-1314 presented at 2010 Fall Meeting, AGU, San Francisco, CA, Dec. 13-17. Kirby, J. T., Shi, F. and Holman, R. A., 2010, "Models and observations of foam coverage and bubble content in the surf zone", Abstract OS43C-06 presented at 2010 Fall Meeting, AGU, San Francisco, CA, Dec. 13-17. Geiman, J., Kirby, J. T., Reniers, A. J. and MacMahan, J. H., 2010, "Modal analysis of rip current cell oscillations", Abstract OS53D-04 presented at 2010 Fall Meeting, AGU, San Francisco, CA, Dec. 13-17. Dong, Z., Kirby, J. T. and Thompson, D., 2010, "A general formulation for wave-current interaction in strongly sheared flows", Abstract OS51B-1281 presented at 2010 Fall Meeting, AGU, San Francisco, CA, Dec. 13-17. Dong, Z. and Kirby, J. T., 2011, "A wave vortex force formalism for wave-current interaction in strongly sheared flows", presented at APS-DFD Meeting, Baltimore. Bull. Am. Phys. Soc., 56, 18, Abstract E3 1. Ma, G. Kirby, J. T. and Shi, F., 2011, "Numerical study of turbulent coherent structures and bubble entrainment under surzone breaking waves", presented at APS-DFD Meeting, Baltimore. Bull. Am. Phys. Soc., 56, 18, Abstract E3 6. Grilli, S., Harris, J., Tayalibaksh, T., Kirby, J., Shi, F., Masterlark, T. and Kyriakopoulos, C., 2011, "Numerical simulations of the 2011 Tohoku tsunami generation, propagation and coastal impact: comparison to field observations, with sensitivity analysis to co-seismic source parameters, model type and resolution", presented at 2011 Fall Meeting, AGU, San Francisco. Dong, Z. and Kirby, J. T., 2012, "A vortex force formulation for waves propagating on strongly sheared flows", Abstract 11806 presented at Ocean Sciences Meeting , Salt Lake City, February. Geiman, J. D. and Kirby, J. T., 2012, "Wave-group forcing of a rip current system", Abstract 11861 presented at Ocean Sciences Meeting , Salt Lake City, February. Ma, G., Kirby, J. T. and Shi, F., 2012, "Numerical study of turbulent bubbly flow under surfzone breaking waves", Abstract 11770 presented at Ocean Sciences Meeting , Salt Lake City, February. Shi, F., Kirby, J. T., Misra, S., Vittori, G. and Ramsey, J., 2012, "Process filtering and input filtering in modeling of sand pit-induced morphological evolution", Abstract 10255 presented at Ocean Sciences Meeting , Salt Lake City, February. Tehranirad, B., Kirby, J. T. and Shi, F., 2012, "Coastal plane estuaries as low pass filters for tsunami activity", Abstract 11819 presented at Ocean Sciences Meeting , Salt Lake City, February. Derakhti, M., Ma, G., Kirby, J. T. and Shi, F., 2012, "Numerical study of coherent structures and fluid-bubble interactions under deep-water breaking waves", Abstract EP53G-05, AGU Fall Meeting, San Francisco, Dec 3-7. Grilli, S. T., Harris, J. C., Tajali Bakhsh, T. S., Tappin, D. R., Masterlark, T., Kirby, J. T., Shi, F. and Ma, G., 2012, "Modeling of the Tohoku-oki 2011 tsunami coastal hazard: effects of a mixed co-seismic and seabed failure source (invited)", Abstract NH42A-06 AGU Fall Meeting, San Francisco, Dec 3-7. 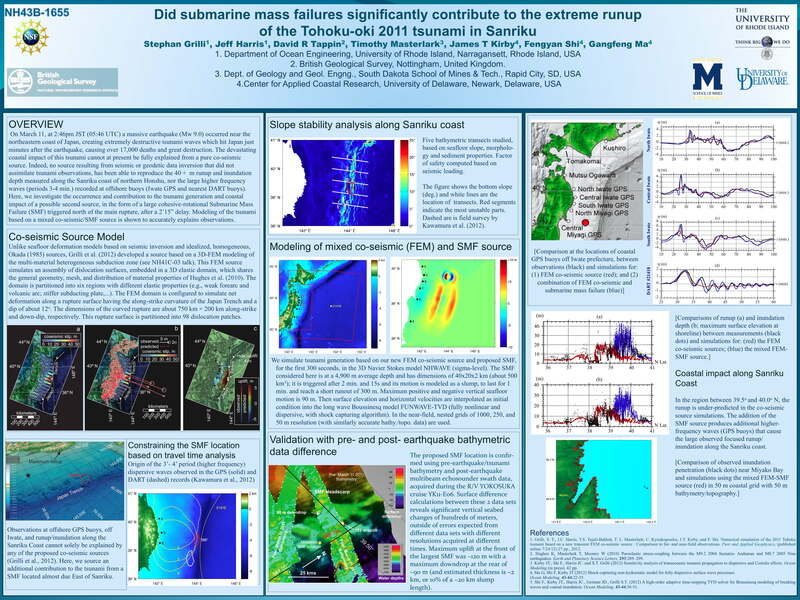 Grilli, S. T., Harris, J. C., Tappin, D. R., Masterlark, T., Kirby, J. T., Shi, F. and Ma, G., 2012, "Did submarine mass failures significantly contribute to the extreme runup of the Tohoku-oki 2011 tsunami in Sanriku? ", Abstract NH43B-1655,AGU Fall Meeting, San Francisco, Dec. 3-7. Kirby, J. T., Ma, G., Dong, Z., Hsu, T.-J. and Shi, F., 2012, "Wave-current interaction in strongly sheared flows", Abstract OS11G-08, AGU Fall Meeting, San Francisco, Dec 3-7. Ma, G., Kirby, J. T., Shi, F. and Grilli, S. T., 2012, "Tsunami wave generation by solid and deformable landslides", Abstract NH13A-1579, AGU Fall Meeting, San Francisco, Dec. 3-7. Masterlark, T., Grilli, S. T., Tappin, D. R., Harris, J. C. and Kirby, J. T., 2012, "Seafloor deformation and localized source mechanisms of the 2011 M9 Tohoku earthquake and tsunami (invited)", Abstract NH41C-03, AGU Fall Meeting, San Francisco, Dec. 3-7. Sawyer, A. H., Shi, F., Kirby, J. T. and Michaels, H. A., 2012, ``Dynamic response of surface water-groundwater exchange to currents, tides and waves in a shallow estuary (invited)'', Abstract H13I-02, AGU Fall Meeting, San Francisco, Dec. 3-7. Shi, F., Kirby, J. T., Ma, G., Holman, R. A. and Chickadel, C. C., 2012, "Field testing model predictions of foam coverage and bubble content in the surf zone'', Abstract OS21B-1732, AGU Fall Meeting, San Francisco, Dec. 3-7. Tajalli Bakhsh, T. S., Grilli, S. T., Harris, J. C., Kirby, J. T., Shi, F. and Tehranirad, B., 2012, "Tsunami hazard assessment along the U. S. East Coast", Abstract NH31D-08, AGU Fall Meeting, San Francisco, Dec. 3-7. Tehranirad, B., Kirby, J. T., Shi, F., Callahan, J. A., Harris, J. C., Grilli, S. T., Tajali Bakhsh, T. S. and Estibels, E., 2012, "Tsunami hazards on the US East Coast: Inundation mapping and tsunami processes over a wide shelf", Abstract NH33A-1645, AGU Fall Meeting, San Francisco, Dec. 3-7. Tappin, D. R., Grilli, S. T., Harris, J. C., Masterlark, T., Kirby, J. T., Shi, F., and Ma, G., 2013, "Differentiating earthquake tsunamis from other sources; how do we tell the difference? ", presented at EGU General Assembly 2013, Vienna, Abstract EGU2013-10211. Dong, Z. and Kirby, J. T., 2013, "Wave current interaction in strongly sheared mean flows", presented at Waves in Shallow Environments, WISE '13, April 21-25. Derakhti, M. and Kirby, J. T., 2013, "Fluid-bubble interaction and dissipation mechanisms under unsteady breaking waves", presented at Waves in Shallow Environments, WISE '13, April 21-25. Schnyder, J. S. D., Kirby, J. T., Shi, F., Tehranirad, B., Eberli, G. P., Mulder, T., Ducassou, E. and Principaud, M., 2013, ``Potential for tsunami generation by submarine slope failures along the western Great Bahama Bank'', 6th Int. Symp. on Submarine Mass Movements and their Consequences, GEOMAR, Kiel, September 23-25.